The Rohan Masters' distinctive style is characterized by a striking experimentation with scale, elongated figures, and a somewhat distorted perspective, together leading to an expressive and dramatic result. The Masters – possibly working in a family workshop, first in Troyes, later in Paris, and next in Angers – explored the realm of human feeling in a manner that is both original and powerfully moving. 150 x 115 mm. – 214 (of 219?) leaves. With 12 full-page miniatures with full borders, many more pages with illuminated borders. 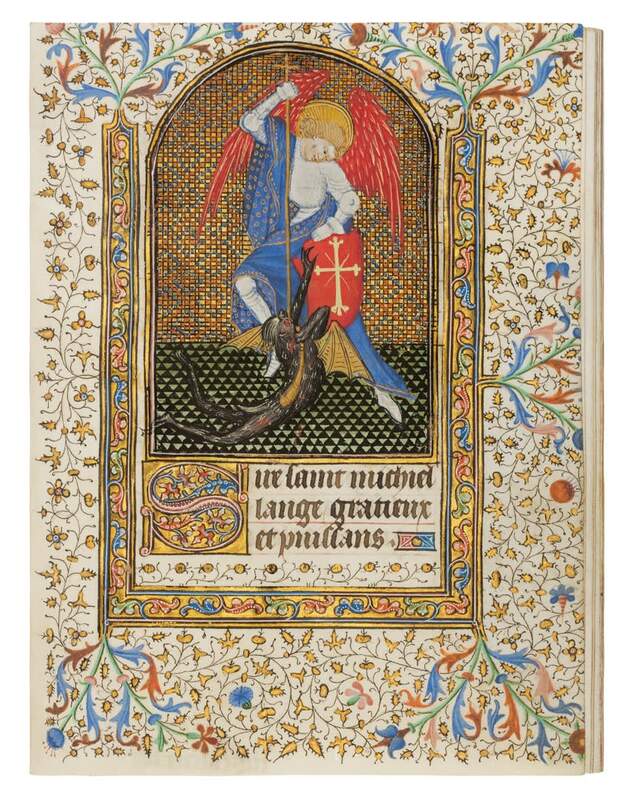 Executed in an early phase of this workshop's artistic development, the illuminations in the present Book of Hours anticipate the impressive, monumental compositions of their later work in the extraordinary Grandes Heures de Rohan (Paris, BNF, ms. lat. 9471), made for Yolanda of Aragon and Alain IX de Rohan, c. 1430, and considered their finest production. In the Grandes Heures, the Rohan Masters' expressive and dramatic style shows clamorous colours, distorted perspectives, and impulsive gestures used for emotional effect – all of which are demonstrable in the present manuscript in a more primordial and modest form. In our miniatures – attributed to a separate character called the Giac Master (after work for the wife of Louis de Giac, preserved in Toronto, Royal Ontario Museum) – the fine figures of St. John Baptist, the Archangel Michael, or the Burial scene anticipate the impressive, monumental compositions of the later oeuvre. Characteristic motifs include long limbs, eyes with small black dots, green-black tiled floors, and golden clouds drifting across the sky. Our manuscript pre-dates the Rohan Hours by about fifteen years. Although the origins of that famous prayer book's main artists – the Giac, Rohan, and Madonna Masters - is unknown, scholars suggest they may first have trained with the Giac Master in the Champagne region, likely in Troyes. Remarkably, they continued their collaboration at least until 1431 when they were in Angers.